Matt Cain’s seven-and-two-thirds inning, four-hit performance last night leaves him with 21.1 innings of playoff ball having allowed just a single run (and it was unearned). With all the other amazing playoff performances, Cain has flown a little bit under the radar. Part of Cain’s inconspicuousness might be because he hasn’t done it with overpowering stuff – just 13 strikeouts – but instead by inducing weak contact. 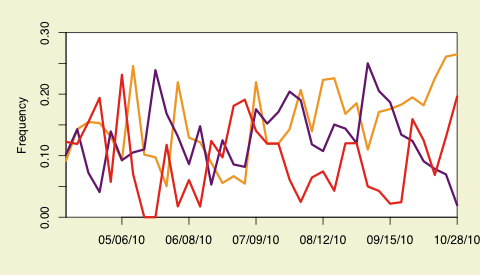 This is a skill Cain has shown throughout his career, with a BABIP of 0.274. I was mostly interested in last night’s game because, looking at the pitchf/x numbers, Cain was throwing a drastically different mix of pitches than he usually does. Cain is a four-pitch pitcher, and his fastball, slider, curve and change distinctly cluster in horizontal movement vs velocity space — making them easy to classify. Here are his pitches for 2010 and last night. You can see how clearly Cain’s pitches cluster out, so there is little ambiguity in classifying them. Last night, compared to the season as a whole, Cain threw more changeups (26% versus 15%), more sliders (20% versus 10%), fewer fastballs (52% versus 62%) and many fewer curveballs (under 2% versus 13%). I wanted to know whether the difference from his average pitch usage was anything out of the ordinary compared to other games (i.e., was it just standard fluctuation between games or a real shift). 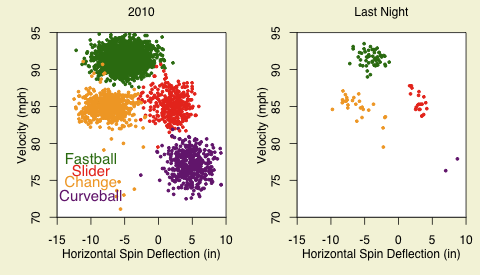 Here are the fractions of Cain’s non-fastballs over the course of the 2010 season for each game, with the same color-code: purple for curves, red for sliders, and yellow for changeups. It looks like last night’s game was the continuation of a trend in decreasing curveball use, throwing the fewest curves of any game this season. On the other hand he threw the greatest fraction of changeups of any game this season, and there have been few games where he has thrown as high a fraction of sliders. It is interesting that Cain would so drastically change his pitch usage during the World Series — and the playoffs in general, where we see the decrease in curves — but, obviously, the results have been good for him. We hoped you liked reading Cain’s Pitch Type Usage in Game 2 by Dave Allen! Should Cain Have Been Pulled for a Pinch Hitter? Dave Allen's other baseball work can be found at Baseball Analysts. Based on watching many of Cain’s games, most of his HR’s allowed have come on haning breaking balls rather than the fastball. Maybe he decided that the curve was more likely to hang than the slider? Just guessing.